V. Karasev, V. Luchinin "Introduction to the design of bionic nanosystems"
The existing religions claiming at the initial stage of development of civilization for explanation all real, gradually reduced spheres of their influence owing to the development of science and understanding by the mankind of its real place in the world. On this way it is possible to allocate two most essential turning points. These are the Copernican heliocentric theory, which gave an objective and realistic representation of Space and our Earth as a part of the Space and the evolutionary theory of C. Darvin which provided a scientific explanation of the origin of species by natural selection. Only two questions remain in the modern science lacking simple and unequivocal answers: what is the essence of life; how could life emerge. On can try to answer these questions basing on the theory which has appeared recently - concept of Systems of the Conjugated Ionic-Hydrogen Bonds (SCIHB concept), reviewed in the book . If the concept is accepted, it may become the third turning point which will contribute to realizing by humans of their nature as living creatures and getting rid of erroneous religious ideas. Before setting forth the SCIHB concept, it is necessary to focus on the notion of “soul” which will be used thereafter. We should emphasize, that though this notion is rather vague, one has intuitive idea of what it is about. Sticking to the layman’s level we will admit that “soul” stands for some non-material substance which is a component living creatures due to which they develop and actively react to external influences. Absence of any reaction suggests that the object is lifeless, i.e. there is no soul in it. The concept essence consists in the following. It is possible to present biomolecules and biostructures in the form of two types of elementary combinations from organogenic elements (C, N, O, P, S). The first type of combinations is simple groups – R–Z, which consist of two atoms of the organogenic elements linked with a s-bond. The second type of combinations - resonance groups - Q-R=X - consist of three organogenic elements linked with two s-bonds and one p-bond, which capable migrate (displace) (Q–R=X ßà Q=R–X) like in resonance structures considered by L. Pauling. In the book the table of such combinations including 5 simple and 15 resonance groups have been suggested, which are classified according to their molecular masses. Owing to similarity of such systems to the polyconjugated systems and presence in them of atoms of hydrogen, such systems are named in the book by "Systems of the Conjugated Ionic-Hydrogen Bonds”, in abbreviated form “SCIHB”. From here and the concept name - concept of SCIHB. They are not something new and absolutely unknown in biology, but thanks to a description generality, get new quality - universality. As the book affirms, that similar systems are a construction basis of supramolecular biological structures and charge (and energy) transfer channels in these structures. This statement is supported by the analysis of a considerable quantity of the modern experimental data received mainly on the basis of studying of concrete biostructures (proteins and their complexes with other structures). Suppose one end of a SCIHB, consisting only from resonant groups, is linked by hydrogen bond to charge donor (HD1 -) with an elevated electrochemical potential and on the other end of a system is linked to an acceptor (HA1) whose potential is low. After D1 molecule is replaced by A2 and A1 by D2 a similar process of charge transfer can proceed in the opposite direction (initial state 2). The process ends by transition to the terminal state 2. After another interchange of donors and acceptors the cycle is repeated. Conditions of realization of the given model in biostructures are formulated and visually presented below. Inputs and outputs of SCIHB are accessible to replaced donors and acceptors. Fig.1. 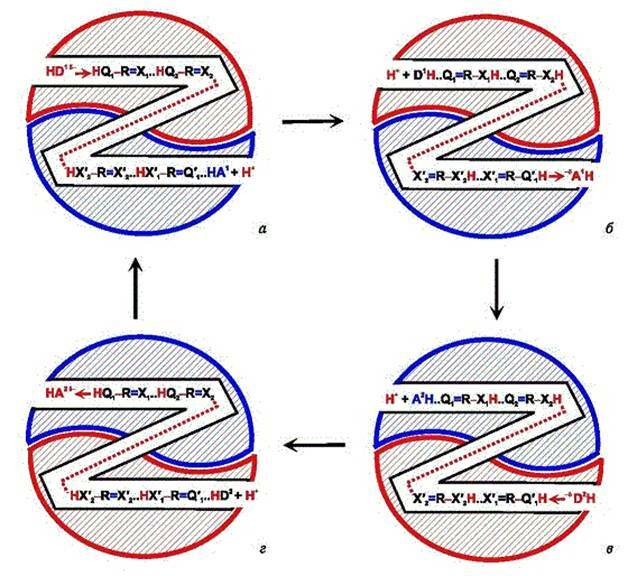 Conditions of realisation of model of charges transfer in supramolecular biostructures. а, в – initial states, б, г – terminal states. From all conditions we will stop only on the first and the fourth which can form a basis for an explanation of the nature and a life origin. Let's stop on the first condition, one of the most important: asymmetry of an arrangement of protons in SCIHB. All atoms of hydrogen in these systems should be located on one side from groups (on the resulted schemes - all at the left or to the right of atoms of groups), i.e. is asymmetric. Asymmetric position of protons is nonequilibrium and should be supported by the permanent functioning of these systems connected with alternate change of donors and acceptors. Thus stability SCIHB also is supported due to this process. Concept SCIHB asserts that in these systems asymmetry of position of protons at the expense of constant change of donors and acceptors of charges should be supported. We concretize this question in application to animals and plants. In animals a direct acceptor of charges is air oxygen. What will occur, if we deprive an animal of air? It from live shortly becomes lifeless. What will occur, if we deprive an animal of food? It also will be lost, though and not so is fast, as in the first case. In plants occurrence of charges is promoted by light. For lack of light plant do not develop and perish. An acceptor of charges in plants is water which thanks to plants decays and as a result oxygen is allocated. Without water the plant will be lost. Thus, elementary displays live quite keep within the predictions following from model of charge transfer. If the constancy of change of donors and acceptors is broken not only asymmetry of position of protons and the mechanism of carrying over of charges on SCIHB is broken. It leads to that the structures containing SCIHB which stability is supported at the expense by constant migration of charges (protons and electrons), will be quickly and irreversible collapse. Everything that we know about live beings, testifies that there comes any moment after the termination of receipt of donors or acceptors when their absence conducts to irreversible destruction live beings. Thus, the structures making a live being, also quickly and irreversible collapse. Carrying over of charges in SCIHB, in particular, transferred by electrons, as well as any electronic process, should be accompanied by electric field occurrence. The numerous effects observed both in a life, and in experiments, can be interpreted from a position of carrying over of the information which is carried out at the expense of this field. Telepathy. As within the limits of concept SCIHB a "soul" is energized state of biostructures, the information which contains electric field in the form of fluctuations of certain frequency, can be transferred to other object and cause in it corresponding fluctuations in SCIHB and to be decoded in the form of corresponding thoughts or actions. Telekinesis. Clots of definitely organized electromagnetic field generated by synchronous synthesis and work of biostructures, containing SCIHB, can cause in some (not in all) objects corresponding effects of an attraction or pushing away and to be observed as moving of these objects under the influence of bioobjects or their parts (for example, hands). Anyway, existence of the similar phenomena by the concept is not denied. Eternity of soul. Within the limits of concept SCIHB «the invisible substance», distinguishing live from lifeless, is carrying of electrons and protons on SCIHB, supported at the expense of constant change of donors and acceptors. With the termination of this process "substance" disappears also. Fast and irreversible transition SCIHB to an equilibrium condition takes place. "Soul" exists only until maintenance of a nonequilibrium condition (asymmetry) of protons in SCIHB will stop. Resettlement of souls. As "soul", from a position of concept SCIHB is energized state of protons and electrons, localized in SCIHB, any live being already has "soul". Accordingly, resettlement of "soul" from one live beings to another is impossible. However it is impossible to exclude possibility of carrying over of the information (at the expense of electric field) from one soul to another, but it is a question not of resettlement of soul (reincarnation), but only about information carrying over. Revival of the died. Existence SCIHB depends on presence of donors and acceptors of charges. If process has stopped for a long time, since any moment process restoration of structures becomes irreversible. The "revival" phenomenon in that case can be interpreted only as awakening of the object which had latent process of carrying over of charges (for example, lethargic a dream). Live beings are the self-reproduced molecular cellular automatic machines constructed on a principle of a continuity of systems of conjugated ionic-hydrogen bonds and using these systems for carrying over of charges and energy. Let's consider the fourth condition of realisation of model of charges transfer: Thermodynamic reversibility of charge transfer on SCIHB. Feature of the mechanism of charge transfer on SCIHB is possibility of their only unitary passage on system of bonds in one direction. However this process can take place successful in the opposite direction. To it can promote identity of donors (D1=D2) and acceptors (A1=A2), participating in reception of charges in direct and return directions, and also symmetry of donor and acceptor sites of SCIHB. Symmetry of SCIHB can be created on the basis of the identical substructures laid symmetrically under the relation to each other. At molecular level it is shown that the majority of biostructures consists of identical subunits, and their number, as a rule, is even. Whether it is possible on the basis of requirement reversibility of charge transfer to present an origin of live beings? It appears it is possible, but for this purpose it is necessary to take into consideration one more theory. It is considered, that the science has not given till now the unequivocal answer to a question on a life origin. However, actually the answer is found for a long time already, though has not received sufficient popularity. It is a question of the theory evolutionary catalysis, developed by prof. A.P. Rudenko . In a short form it is stated in the book . Within the limits of the evolutionary catalysis theory object of chemical evolution in which course there were biosystems, is the elementary opened catalytic system (EOCS), i.e. complete set of the catalyst, reacting substances and products in all phases catalytic stages, connected in a uniform kinetic continuum. Such objects which basis of existence is basic process, have passed in process of long evolution and selection the way which has led to occurrence of biosystems. A.P. Rudenko's theory describes the general laws of chemical evolution, not concretising the mechanism of carrying over of charges which can underlie realization of basic reaction. However at transition directly to an origin of biosystems it is necessary to consider the concrete mechanism of carrying over of charges in them too. As we saw, the mechanism of charges transfer on SCIHB can be realised only under condition of symmetric subunit organizations of structures. In book  prebiological structures with such organization are named EDOCS (elementary duplicated opened catalytic systems). Subunit structure of EDOCS creates a condition for their interaction at population level and exchange by subunits therefore structures with higher symmetry and higher capacity of basic reaction can be formed. In turn, it increases duration of their existence and possibility of participation in the subsequent recombination. Such mechanism of recombination and selection of EDOCS on a maximum of basic process carries the name of population-template model as passes at level of the population which is simultaneously a template of selection too. Let's assume, that there is population EDOCS catalyzing the same basic reaction. Suppose that at stage of 1st generation is available six variants of the duplicated structures with a miscellaneous, but low level of catalytic activity - a1, a2 .... a6. 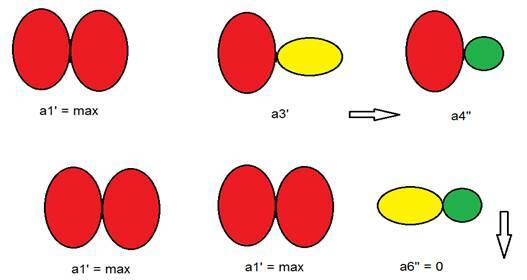 Further, suppose, that at this stage between them there was a recombination process: a1 subunits has exchanged with a2: (conditional record: a1--> a2), a3--> a4, a5--> a6. As a result of recombination it was formed four variants with different catalytic activity, and a variant a1 ’ - with maximum activity, characteristic of symmetric structures, but two variants - with zero activity (a2' = 0, a6 '= 0). Variants with zero activity die (precipitate) and the remaining EDOCS at a stage of 2nd generation re-enter the recombination: a1 '--> a3', a4 '--> a5'. As a result of this recombination another precipitating variant with zero activity (a5 "= 0) was formed. The remaining three variants of EDOCS again come to the recombination (a stage of 3rd generations), for example a3 ”-> a4”, in which two variants of EDOCS with maximum catalytic activity (a1 '= max) and one more variant with zero activity (a6 "= 0) form. Last variant is also precipitated. The subsequent recombination has not lead to an increase in catalytic activity at EDOCS as they reach perfection (maximal symmetry and maximum power of basic reaction). However, further development can take place in more complex systems such as membranes and increase of the power of basic reaction will proceed. Already such simplified scheme shows that in the process of recombination and selection of active duplicated structures and EDOCS generational change there is a process of enrichment of population by duplicated structures with a high degree of activity and a higher symmetry. Interested persons can, by setting various parameters, to simulate this process on a computer in a much more complicated form. However, as it is possible to believe, the results of such simulations will be quite expected. Thus, within the limits of population-template model the appearance of the existing mechanism of recombination and selection of living beings accompanied by change of generations, could be predetermined at the earliest stage of chemical evolution and is caused by the mechanism of carrying over of charges on SCIHB , providing in biosystems passage of basic process. Hence it is easy to understand why live beings are exactly what they are and why they exist, usually in the form of two subspecies of the sexes, why their reproduction processes associated with the recombination of the initial monomers (gametes) with a subsequent restoration of duplicated structures and why in the process of evolution there is an alternation change of species generations. The above concept SCIHB and population-template model for the origin of biological systems using this concept, complement our understanding of the nature and origin of biological systems. They do not require the use for an explanation of origin of live beings ideas of their extraterrestrial origin (panspermia) or acts of "creation." However, they can be a stimulus for further research and promote deepening of our knowledge about ourselves. 1. V.A.Karasev and V.V. Luchinin. Introduction to designing of bionic nanosystems. M.: Physmatlit. 2009. 464p. (in Russian.). 2. Rudenko A.P. Theory of self-development of opened catalytic systems. М: Mosk. Univ. Publ. Hause. 1969. 272 pp. (in Russian. ).